Position Emission Tomography (PET) measures emissions from radioactively-labeled chemicals that have been injected into the bloodstream, and uses the data to produce images of the distribution of the chemicals in the body. In drug abuse research, PET is being used for a variety of reasons including: to identify the brain sites where drugs and naturally occurring neurotransmitters act; to show how quickly drugs reach and activate receptors; to determine how long drugs occupy these receptors; and to find out how long they take to leave the brain. PET is also being used to show brain changes following chronic drug abuse, during withdrawal from drug use, and during the experience of drug craving. In addition, PET can be used to assess the effects of pharmacological and behavioral therapies for drug addiction on the brain. NIDA. "Understanding Drug Abuse and Addiction: What Science Says." National Institute on Drug Abuse, 11 Feb. 2016, https://www.drugabuse.gov/understanding-drug-abuse-addiction-what-science-says. NIDA. Understanding Drug Abuse and Addiction: What Science Says. National Institute on Drug Abuse website. 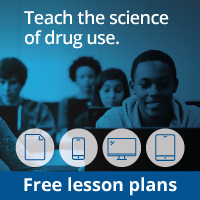 https://www.drugabuse.gov/understanding-drug-abuse-addiction-what-science-says. February 11, 2016.